On 21 October 2018 wildfires ignited in Vermaaklikheid near Riversdale in Hessequa. A few days later, more wildfires started in the George municipal area. 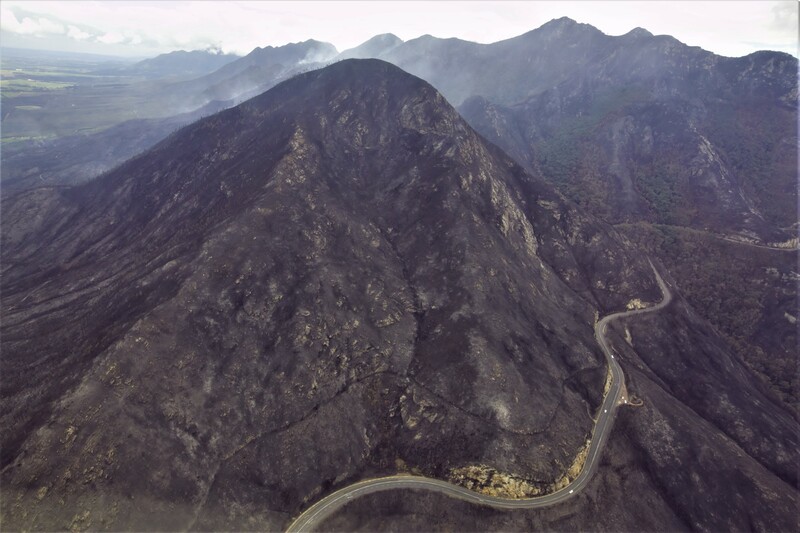 The Disaster Management Centre of Garden Route District Municipality (GRDM) recorded 12 wildfires over the month of October/November 2018, which also resulted in the death of 9 people, including a Working on Fire pilot. Said to be one of the biggest wildfires recorded since the great wildfire of 1869, the Garden Route is facing a new “normal”. The change can be seen across the globe and it is almost common knowledge that climate change is not on our side. This poses an important question – how can we address this? Can we prevent these type of occurrences in the future or are we doomed? In short, the Head of Disaster Management at Garden Route District Municipality, Mr Gerhard Otto explains: “ Municipalities and stakeholders, together as a collective we have to develop a system to better plan for fires in our wildland-urban interphase (WUI). Our town planners need to factor wildland fire risk into future development planning and our bylaws, as well as building codes, will have to be altered to ensure resilience to this type of fire incidents. With this, I mean that there should be adequate by-laws in place to address issues like high fire hazard areas. When we look at the urban fringes (where homes at the edge of neighbourhoods meet the forests), inhabitants should be made aware of the fire risk in these areas and a defensible space should be created around all properties not only to create a buffer area but also to provide a space from where firefighters could launch their firefighting actions when fires do approach these areas. In my opinion, the current fragmented approach to fire service delivery is central to many of our challenges, the sooner we centralise firefighting services by establishing a metropolitan municipality and address integrated veld fire management the better – “all efforts should be coordinated from one central authority”. He also added: ”During the recent wildfires, we managed to pull resources from all over South Africa together to work at our Joint Operations Centre at the GRDM head office. I know that since last year’s Knysna fires we have improved the way in which we do things, but there is always room for improvement”. The following role players must be thanked for their selfless dedication to protect our communities and infrastructure over the past month: Provincial Disaster Management Centre, Working on Fire (WoF), South African National Defence Force, Cape Nature, SANParks, George Municipality, Knysna Municipality, Oudtshoorn Municipality, Bitou Municipality, Hessequa Municipality, Mossel Bay Municipality, Kannaland Municipality, Overberg DM, Cape Winelands DM, West Coast DM, City of Cape Town, Various NGOs and FBOs (Lions Alert, Rotary SA, Gift of the Givers, Garden Route Rebuild), SPCA, National and Provincial Departments, Department of Health, EMS, Human settlements, Rural Development, Housing Development Agency, Department of Agriculture, Department of Education, SASSA, DSD, ESKOM, Department of Transport, Provincial Traffic and SAPS.